SAN JOSE, Calif., March 8, 2018 /PRNewswire/ -- Super Micro Computer, Inc. (NASDAQ: SMCI), a global leader in enterprise computing, storage, networking solutions and green computing technology, is driving the server and storage industry's rapid transition to 25G Ethernet Networking technology with a robust selection of network interface card (NIC) and top-of-rack (ToR) switch solutions. As memory, processor and storage performance increase, the demand for expanded network capacity follows naturally. When combined with increased system performance, 25G Ethernet helps enterprises deliver new products and services to market faster. These innovations support smarter machines and bigger data with 2.5 times faster single lane network performance than 10G -- all at about the same cost. According to industry analysts, 25G will triple in volume over the next year or two. "The time for transitioning from 10G to 25G networking is now, and the transition is happening very quickly!" said Charles Liang, President and CEO of Supermicro. "Self-driving cars, AI, machine learning, big data and NVMe-over-Fabric (NVMe-oF) are all pushing system performance to the limits and driving the demand for more network bandwidth. With higher performance, better scalability, as well as an easy and clear upgrade path to 100 Gigabit Ethernet networks, customers are upgrading their networks to 25G to increase network throughput -- meeting the needs of those applications that are now hungry for even more bandwidth." Supermicro offers a wide range of 25G NIC solutions that empower customers to future-proof nearly any Supermicro system by equipping it with 25G Ethernet Networking technology. All of Supermicro's 25G products are dual-speed, so they can operate at either 10G or 25G. This offers superior investment protection for companies only beginning to evolve from a 10G to a 25G network infrastructure. Customers can install these systems today and interconnect with their existing infrastructure; when the time to upgrade to 25G comes, it is merely a configuration update -- no need for a disruptive and costly hardware change. Supermicro also offers a 25G switch (SBM-25G-100) with the X11 SuperBlade®. This switch can be used with either the 8U SuperBlade enclosure (SBE-820J) or the 6U SuperBlade enclosure (SBE-610J) and features twenty 25G downlink connections, four QSFP28 ports where each port can be configured as 40G or 100G uplink connections. Using splitter cables, individual 40G ports can be split into four 10G ports or the 100G port can be split into four 25G ports. Like the standard 25G ToR switch, the blade switch auto-negotiates and is compatible with 10G networking, providing customers a clear path to future 25G upgrades to their existing datacenter infrastructure. Customers who are familiar with the Blade networking management interface of MBM-GEM-004 will benefit from using a similar GUI/CLI interface with the new 25G switch. Additionally, it supports the latest networking protocols required for today's datacenter and cloud infrastructure environments. The 25G mezzanine card that interfaces with the blade server supports RDMA/RoCE, DPDK, packet pacing, flow steering and Ethernet offloads. 25G Ethernet improves productivity in many diverse applications. For example, Web centric or e-commerce business models always drive demand for more network bandwidth. Similarly, high-performance computing (HPC), distributed applications and clustered databases need fast networks as well. And NVMe-over-Fabric (NVMe-oF) absolutely drives up the requirement for higher NIC and backbone network speed. Supermicro's many 25G solutions can support these applications effectively. 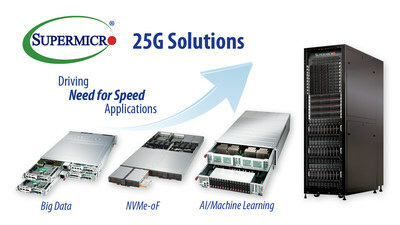 For more information on Supermicro's 25G NIC and switch product offerings, please visit https://www.supermicro.com/networking. Supermicro, SuperServer, Server Building Block Solutions, SuperBlade and We Keep IT Green are trademarks and/or registered trademarks of Super Micro Computer, Inc.